Background: Single port or single incision laparoscopic surgery (SILS) is a recent technical advancement in the arena of minimally invasive surgery. Many variations of SILS cholecystectomy have been described in the literature. To date there are only 2 publications documenting 100 SILS cholecystectomies. None clearly describe whether it was a single surgeon experience. We present the largest single surgeon experience of 100 SILS cholecystectomies using the same technique throughout. Methods: SILS cholecystectomies were performed using a 3 trocar technique through a 3-4 cm transumbilical incision. Trocars included one 5 mm 15 cm Optiview trocar and 2 Dexide 5 mm trocars. A 5mm 45 degree long Stryker laparoscope was used for all cases. Gallbladder retraction was facilitated with 2-0 prolene suture using a Keith needle. 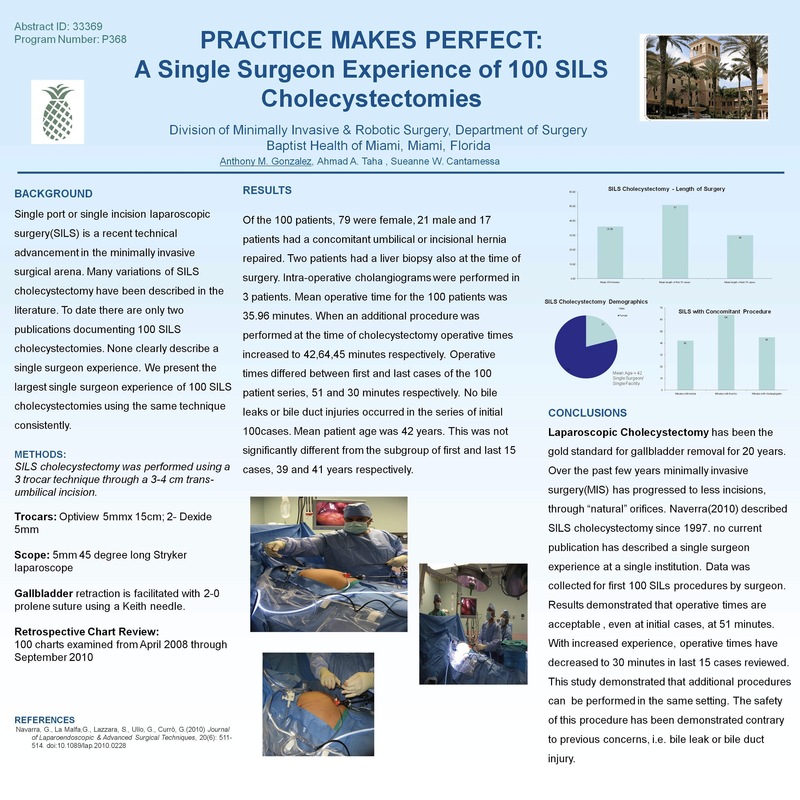 We retrospectively reviewed the charts of 100 SILS cholecytectomies performed from April 2008 to September 2010. Results: All cholecytectomies were performed by a single surgeon at a single facility. Of the 100 patients, 79 were female and 21 were male. 17 patients had a concomitant Umbilical or incisional hernia repaired. 2 patients had a liver biopsy at the time of surgery. Intra-operative cholangiograms were performed in 3 patients. Mean operative time for the 100 patients was 35.9 minutes. When an additional procedure was performed at the time of cholecystectomty (Umbilical/Incisional hernia repair, liver biopsy & cholangiogram) operative times increased to 42, 64, 45 minutes respectively. Operative times differed also between first and last 15 cases of the 100 patient series, 51 and 30 minutes respectively. No bile leaks or bile duct injuries occurred in the series of initial 100 cases. Mean age of the 100 patients was 42. This was not significantly different form the subgroup of first and last 15 cases, 39 and 41 years respectively. Conclusion: Laparoscopic Cholecystectomy has been the standard for gallbladder removal for 20 years. Over the past few years minimally invasive surgery has progressed to less incisions and through “natural” orifices. Naverra has described SILS cholecystectomies since 1997. No current publication has described a single surgeon experience at a single institution. We have collected a series of the first 100 SILS cholecystectoemies by a surgeon. It has been demonstrated that operative times are acceptable even at initial cases, 51 minutes. Furthermore, with experience, the operative times will decrease, 30 minutes in last 15 cases. We have also demonstrated that additional procedures can be performed in the same setting. Contrary to previous concerns, safety of this procedure has been demonstrated, i.e., no bile leaks, bile duct injuries. SILS cholecystectomy can be performed safely and inexpensively as demonstrated in this series of 100 patients by a single surgeon.